With the 2014 NHL Entry Draft quite some time away, some might be wondering why certain prospects are being examined in depth at this point in time – especially with a little less than half the NHL regular season still left to be played. Well, it’s never a bad time to start going over some of the prospects that will be available at this year’s draft in Philadelphia, and with so much attention being devoted to the likes of Sam Reinhart and Aaron Ekblad, fans probably wouldn’t be against the notion of getting to know some of this year’s more intriguing draft-eligible goalies. While this piece will only look at North American goalies, fans should keep in mind that there are still some netminders that could vault themselves up the rankings with solid second-half performances. Despite the fact that some of the goalies identified on this list might not be drafted this year, this is not to say that these same netminders can’t improve their stock in the next couple of years as they remain draft-eligible. Barring any injuries or inconsistencies, Thatcher Demko should be the first goalie selected at this year’s NHL Entry Draft. At 6’3″ and almost 200 lbs., Demko definitely has the size to be a competitive goalie in the NHL one day, and teams are likely very well aware of that factor – especially since the goalie was recently ranked as the number one North American goalie by NHL’s Central Scouting Services. Demko plays a butterfly style, has good lateral movements, and does not give up his size when dropping low. Given the fact that Demko has played well at the USHL level and is now excelling at the NCAA level as a freshman in Boston College (.911 Save Percentage, 2.38 GAA, 7 GP), it wouldn’t be a surprise to see the netminder selected in the late first round or early second round. 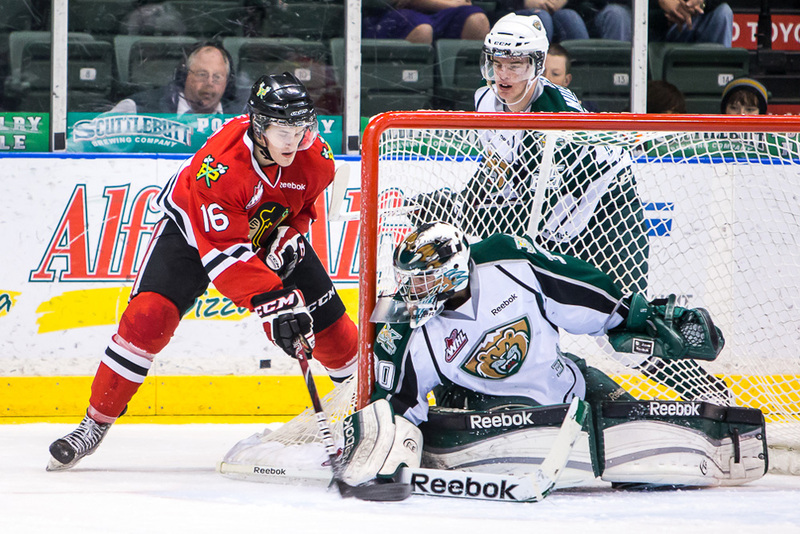 Much like Demko, Edwin Minney is a big netminder as he stands 6’4″ tall and weighs slightly over 190 lbs. Over the last season-plus, Minney has made great strides as his numbers have vastly improved (8 GP, 2.58 GAA, .916 Save Percentage) from last season – as has his strength training and off-ice conditioning. 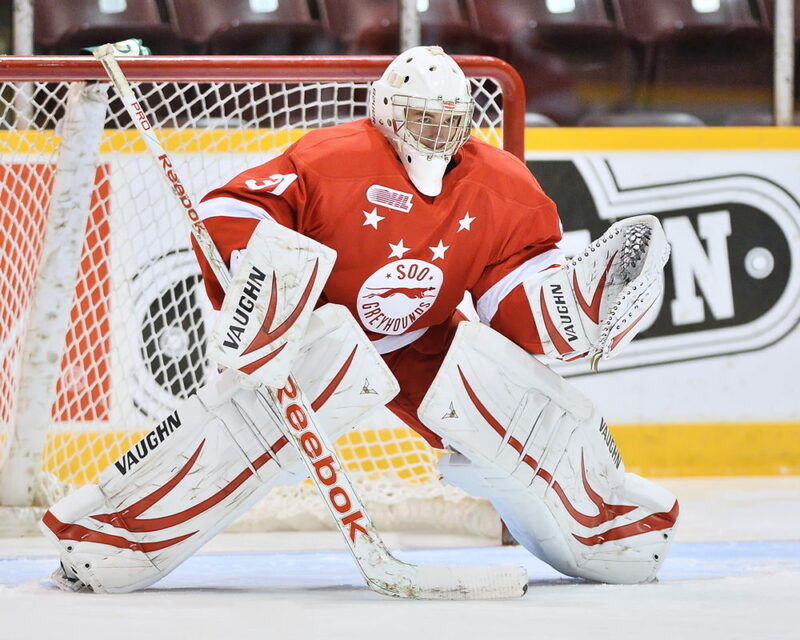 Minney has already committed to Michigan State University for next season and it wouldn’t be a surprise to see the netminder selected in the middle rounds of the draft if he maintains his current level of play. Over the last three seasons, Chase Perry has been playing some pretty consistent hockey, and his time at Andover High School definitely prepared the youngster for the NAHL. Perry will undoubtedly go into this year’s draft hoping to be the NAHL’s 2014 version of Anthony Stolarz or Evan Cowley as the latter two goalies were selected by NHL teams straight out of the North American Hockey League. Perry is a very athletic and reflexive goalie, so his sound technical play only complements his size. As long as Perry finishes off this season at, or near, his current numbers (2.26 GAA, .910 Save Percentage), then the goalie will have excellent prospects for selection at the 2014 NHL Draft. If one looks at Blake Weyrick’s statistics from last season, then they might not be too impressed with the goalie, but then they would be conveniently ignoring the netminder’s progression over the last four seasons. Weyrick certainly impressed during his time in Shattuck St. Mary (Bantam & Midget level) and gradually adjusted to play in the USHL and USDP in 2012-2013. Even though Weyrick has only appeared in two games for the USNTDP Juniors team this season, the goalie has a fair amount of experience on the international stage (WJC-18, Ivan Hlinka Memorial Tournament) and has shown steady progression in various levels of hockey over the last several years. Among the top five goalies in CSS’s midterm rankings, Weyrick has filled out his frame the most as he currently weighs in at 203 lbs. – something that could undoubtedly play into his favor on draft day. As per @OTBPuckWatch 2014 draft prospect Blake Weyrick commits to Brown. Goalie will join fellow 2014 hopeful Tyler Bird. Great for Bears. Alex Nedeljkovic has shouldered quite a workload with the Plymouth Whalers this season as he has started 39 games for his OHL team, and that is something that could very well help the goalie’s stock for draft day. Last season, Nedeljkovic came in and played 26 games for the Plymouth Whalers while recording a 2.28 GAA and .923 Save Percentage. This season, Nedeljkovic has seen his statistics take a bit of a hit (3.11 GAA, .918 Save Percentage), but that shouldn’t take away from the fact that the 18 year old is an impressive netminder by most standards. Despite being only 6’0″, Nedeljkovic fills out his frame quite nicely at 184 lbs. and has great reflexes and lateral capabilities for a smaller goalie. To some, Ty Edmonds’ statistics (3.44 GAA, .901 Save Percentage) might inspire wonder as to why the goalie was ranked so high on CSS’s midterm assessment, but it is plain to see that the scouting service sees something in the 6’2″ goalie. Edmonds’ progression with the Prince George Cougars has been of particular note as the goaltender came in and battled his way to the number one starting role for his WHL team. In 28 games this season, Edmonds has shown strengths in areas such as rebound control, positional play, and challenging of shooters. With the Prince George Cougars fighting for a playoff spot in the WHL’s Western Conference, a postseason berth would probably help Edmonds’ 2014 draft stock. Austin Lotz was passed over during the 2013 NHL Entry Draft, but that certainly isn’t a death sentence for prospect goalies. Lotz was ranked as the no. 11 North American goalie in CSS’s midterm rankings, and there is little to suggest that the netminder won’t be considered by teams at this year’s draft. In each of his three seasons with the Everett Silvertips, Lotz has shown steady development – something that the goalie has made blatantly apparent by playing to the tune of a 2.40 GAA and .910 Save Percentage. Compared to the other top ten goalies in CSS’s midterm rankings, Lotz may be a bit undersized at 6’0″, but he certainly has the athleticism and competitiveness to be a good prospect for any team that selects him. After making his way through the Jr. B SM-sarja and Jr. A SM-liiga in Finland, Kaskisuo made his way over to North America to play in the NAHL this season. To say that the Finnish netminder has had a smooth transition to a North American style of play would be an understatement as Kaskisuo has been absolutely brilliant for the Minnesota Wilderness. In 23 games played in the NAHL this season, Kaskisuo has put up a 1.41 GAA and a .947 Save Percentage, and has added a mere eight shutouts to his short stint in the North American Hockey League. With Kaskisuo committing to University of Minnesota-Duluth, the netminder – whose age (20) and experience overseas will probably benefit his draft stock – will once again have to adjust to play in a different hockey league, but if the goalie’s resume has shown anything, then it is the fact that the Finnish goalie excels wherever he plays. @NAHLHockey goalies continue to rise in CSS ranking prominence. Perry (4th), Finnish-born Kaskisuo (16th, ’93), and Vogler (31) in there. 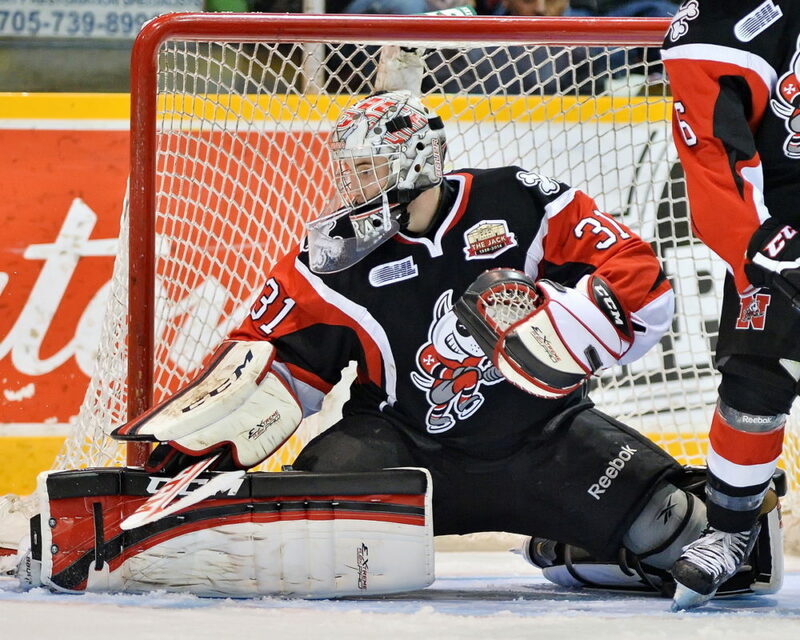 Since coming over to the OHL, Moran has had a steady transition over the last two season with the Niagara IceDogs. Even though Moran’s stats (4.16 GAA, .883 Save Percentage) might suggest that the goalie isn’t having the best season, the goalie has faced quite a lot of shots and has a very young defensive core playing in front of him. Not only does Moran have the size (6’3.5″, 186 lbs.) to be an intriguing prospect, he has also made gradual improvements as a member of the IceDogs, and has been a steadying force for his team. Moran currently holds a solid no. six CSS midterm ranking, but the interest that he draws on draft day will depend largely upon his body of work during the second half of the OHL season. After his performance in the top prospects game in Calgary, McDonald only reinforced his CSS midterm rank as the best available goalie out of the QMJHL. Julio Billia and Keven Bouchard might give McDonald a run for his rank during the second half of the season, but it is plain to see that the upside for McDonald is tremendous at this point in time. Keven Bouchard’s first year in the QMJHL has not been a bad one by any standards. The first year player for Vals-d’Or Foreurs has managed to compile a 3.40 GAA and .870 Save Percentage for his team, and will probably be given a strong look by many teams at the end of the season as the goalie has put in the requisite work in the Q, as well as the QMAAA, in order to be noticed. At 6’2″ and 205 lbs., Bouchard is one of several netminders (Phaneuf, Weyrick, Kaskisuo, McGovern, Appleby, Hackett, Bow, & Vogler) that has filled out his frame quite nicely. As long as Bouchard finishes off the season in strong fashion for Vals-d’Or, then it is safe to say that the goalie might be yet another QMJHL netminder to be selected at this year’s draft festivities. Much like Bouchard, Halverson is adapting to his first season in the CHL as he is transitioning to the Sault Ste. Marie Greyhounds from the MWEHL. Halverson has only appeared in 11 games thus far, but his peripheral statistics (3.21 GAA, .889 Save Percentage) aren’t too shabby for a first year player in the OHL. At 6’3.5″ and 176 lbs., Halverson still has to fill out his frame a bit more, but the initial evaluation of the netminder has seen him described as a good puck tracker that has good reflexes and communicates well with his teammates. Halverson’s size definitely makes him a good option for consideration for this year’s draft class of goalies, but the Traverse City, Michigan native will have to prove himself during the second half of the OHL season in order to keep his high CSS ranking intact.